Mix matzah meal, eggs and salt. Form into balls and boil in 6-quart pot filled with salted water for 20-30 minutes. Remove and drain. Put in soup broth until ready to serve. Note: Many communities have the custom of not eating wetted matzah on the first seven days of Passover. 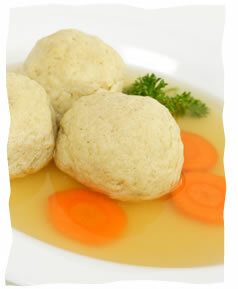 In these communities, matzah balls and other recipes that use matzah are used only on the eighth day of Passover.